There are tons of apps available for playing Blackjack, both on Android as well as iOS’s App Store. But very few of these apps provide any fun, really. Most of them are poorly designed and in the end simply feel like waste of storage on your phone. You should not get disappointed; there are still many good and fun promising Blackjack apps available for download. Following are the finest and the most trusted apps for playing this fine game on Android smartphones as well as iPhones. Real Blackjack has been designed to give the player a real casual feel. This app is suited for both beginners as well as advanced players. The game in itself is quite entertaining (and easy to learn for first timers). There is also help available so that you can understand the odds involved. The help part is so well designed and extensive that you can even find a basic card counting guide in it. Even though advanced players would not feel the need for such an extensively documented help guide, it is welcomed for those who play the game as new users, as it works like a crash course in Blackjack. Most of the reviewers feel that this is not the best looking app for playing Blackjack and perhaps they are right too. So why is it even on this list? The plus of this app does not lie in its looks but in the fact that it provides a more balanced approach when it comes to odds. The app offers the players two different modes. You can either play for free or if you wish you can upgrade to the pro version. 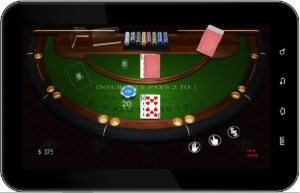 The basic free version of the app offers a simple and basic Blackjack game. The pro version on the other hand offers the players with exceptional features such as the “Cheat Mode” and the “X-Ray”. Card Counting and Expected Value also features in the pro version of this app. The Cheat Mode allows the deck to be stacked in the favour of the player whereas the X-Ray mode allows the player to have a sneak look at the dealer’s whole card. This is easily the best app available on the App Store for playing Blackjack. As the name of the app suggests, it allows the player to play up to three hands simultaneously. Designed on one of the best game engines available for mobile gaming and graphics, this app offers a very realistic gameplay. Unlike many other apps available on the Android market, this app comes for a premium, therefore it is not free – but rest assured that your money will be well spent on this purchase. In almost every review by the top game reviewing sites, this app has come on the top. Unlike the app reviewed above, Blackjack 88 is free for all. It is available for both iPad users and iPhone users. The strength of this app lies in its interface. It seems as if the designers of this app wanted it to feel welcoming for beginners. The interface is lovely and really easy to use. The app is well designed and provides a solid gameplay. Even though the app itself is free, you might have to make some chip purchases in the game. It allows you to play on multiple devices. Just log in with the same account on any Apple device and you will be able to play the game exactly where you left it the last time!